It is highly likely that the government will begin the privatisation of Royal Mail later this year. Along with a sell off comes the real threat of stamp prices hitting £1. Price regulation on most stamps was scrapped to boost its attractiveness to investors. It is also quite possible that Royal Mail’s VAT exemption will become unlawful. Add VAT to just one price increase similar to the last one and the first class stamp would hit 94p. It is highly likely that the government will begin the privatisation of Royal Mail later this year. Along with a sell off comes the real threat of stamp prices hitting £1. Price regulation on most stamps was scrapped to boost its attractiveness to investors. It is also quite possible that Royal Mail’s VAT exemption will become unlawful. Add VAT to just one price increase similar to the last one and the first class stamp would hit 94p. Those most sensitive to price increases are inevitably those that need the Royal Mail most of all. Job seekers sending CV’s, the elderly or small businesses are the least able to withstand rocketing prices. The inevitable cost cutting that will follow a sale will also place a big question mark over services to rural areas and the various freepost services for the blind and our forces overseas. The postal services regulator has been busily working out the true cost of rural services and was considering how acceptable it is for rural services to be cut back. While they would not be so foolish to recommend reductions at this point, there is no doubt that loss making activities will go under the microscope soon after a sale. Both Royal Mail and the government will claim this is “speculative” or exaggeration. Don’t be fooled by that. Privatisation was going to be the cure all but it hasn’t worked out that way. Our energy bills are at shocking levels and few will claim that the privatisation of the railways has worked out to the advantage of commuters. Save Our Royal Mail would like ministers to take a step back from a hasty sale. We believe the public want to know how prices can be controlled and rural and freepost services protected if ownership changes. At the moment there are some protections in law, but these are insufficient to stop a privately owned Royal Mail cutting back where it is most needed. Not everything in life should be defined by its monetary value. Royal Mail is part of the fabric of the nation – we don’t want to see it ripped apart. If the Royal Mail is sold off affordable prices, rural services and free postal services for our service men and women as well as vulnerable groups will disappear. The aim of our campaign is to persuade politicians that they must act now and guarantee that these vital services do not disappear. We have the support of groups and individuals representing the countryside, the blind and partially sighted, the elderly and small businesses. You can help us by getting involved. Use the social networking tools on our site to promote the campaign and most importantly write to your MP setting out your concerns. As our campaign grows so will this site. Please visit our website, get involved, write to your MP and sign our petition. Why should we be paying money for a service not many want? We’ve lost 35 billion on the pensions. That’s disappeared into a black hole of hide the debts. Times are changing. More and more is sent by email – including CVs. The mail can’t compete with a method of sending information that costs fractions of a penny. It should change to cope with the circumstances. Though email and the web have increased it has also lead to an increase in parcels as everyone buys via the internet to have it delivered. Much better than travelling to a shop to buy something. Better for the environment too to have one truck travelling around than loads of people doing lots of trips. The true cost of Royal Mail services is paid either way, the only difference is who pays. Why should we pay through taxation rather than through paying the full economic cost on stamps, a solution which would ensure everyone pays according to what they use? Why should people in urban council estates subsidise postal services for those who choose to live out in the sticks? Royal Mail have made a BIG mistake… We sent a smallish parcel, which cost £3.15 before and now it’s £6.30!!!! Way to go on pulling online businesses apart! The estimate that a first class stamp will cost a pound is a gross underestimate. The first act of a privatised Royal Mail will be to abolish the jewel in the crown of the postal service, universal pricing. As with the privatisation of all other public services, costs will increase and accountability will decrease. Postal delivery will be charged per mile and the service will become unaffordable for many. 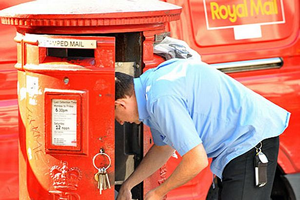 There are those who argue that as the Royal Mail doesn’t deliver as many letters as it did in previous years it will never make any money and should be privatised. This is of course a false argument as, due to the internet, people are ordering more items than every before and indeed the cost of parcels is keeping the price of stamps down to a reasonable level. There are those who complain that the cost of pensions for those who work for the Post Office is too high, but of course they ignore the fact that the government has milked hundreds and hundreds of millions of pounds from the service in profits every year. If successive governments had not been so greedy the pension fund would be in surplus. There are some institutions which define a nation, the NHS and the Royal Mail are two such organisations. They help create a civilised country where people are the benefactors of a joint enterprise. The Royal Mail must be protected at all costs. This issue is a worthy catalyst for a general strike. If Royal Mail gets privatised deep rural villages will receive one delivery a week. The licence Royal Mail operate is called (U.S.O.) Universal Service Obligation. It means all addresses in the UK gets one delivery a day, losing that, Royal Mail can cherry pick where & whenever they would deliver too for over inflated prices. Just like the mines should have been protected at all costs. That’s what Scargill wanted. No matter that the taxpayer was putting in more into the mines than they earned. Royal Mail is a grossly inefficient,wasteful,lazy organisation,I know because I’ve worked for it for 27 years,it’s time to drag it into the 21st century! I see yet another public service auctioned off to the highest bidder, in a another service that will eventually end up costing the user to what measure?. This service is a must to remain in the public domain, why? because to send a letter/ mail a parcel/ connect with somebody/ will no doubt be soon out of the reach of the standard public. The rural service will suffer the most with delivery no doubt costing in the countryside, with more and more services digitalising, and the public generally considered to be picking up the majority of the work to- do in many corporate relationships, such as waiting on the telephone line and service problems. To what extent can the public refuse this!, when such back handed tactics are used to bring in deals such as this when the public own the right to decide. Surely the general public have the right to decide on the future of services which they surely own with their contributions and their own hard work. Its disgusting!!!! I read simons reaction, to the fact that he dosent want to subsidise rural delivery? I dont choose to live in the sticks, I was born in the sticks and just because I and many other people live outside citys dosent mean we should foot the bill to a service used equally by many in and out of the citys. Maybe we in the sticks should start to charge for the production of fruit and veg, the delivery to the citys, and how about fish do you get that in the city too? idiot!!! .